The BC02 model offers an easy hands-free connectivity for smartphones and navigation systems Bluetooth® and it comes with a double earphone to listen your favorite music while travelling. Moreover, the BC02 provides voice answering function and dual Link system, which keeps connected to your phone even when connected as intercom with the model BC03. The new communication systems range Shad is specially designed to offer a safe communication and riding, as it allows you to communicate through your smartphone in a completely legal way while riding, making your trip safer and more entertaining. 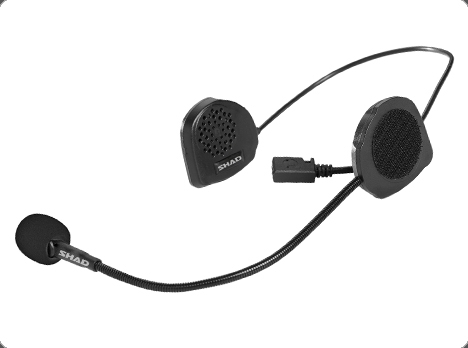 Receive your calls in an easy and safe way while riding your scooter or motorcycle with the SHAD hands-free set using just one multifunction button. Easy to install, the system is designed to be completely integrated in your helmet. 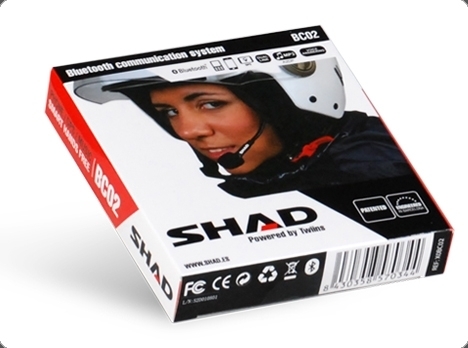 Ready to operate as an intercom: you can pair your SHAD BC02 device to a SHAD BC03 and activate the intercom mode, without losing the hands-free features for your phone. Dual link: While connected to a SHAD BC03, if you receive a call, the intercom function will stop and then resume when the call ends. SHAD manufactures and distributes cases of various capacity and styles ranging from large motorcycles to scooter and maxi scooter. Common characteristics of all SHAD cases are the great quality of the materials used, increasing their guarantee and resistance, their high performance and their innovative aesthetics.